At Barbecue University we have a world-class collection of grills, smokers, and wood-burning ovens. Some units, like the monster Kalamazoo tri-fuel grill, cost as much as a new car. So why have our students gathered around what looks like a black metal trashcan? 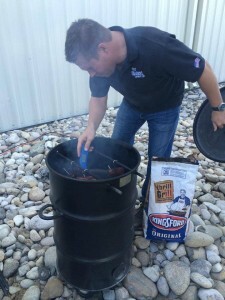 Why has the Pit Barrel Cooker (for that’s the name of the device) become one of the most popular and best-selling grills at Barbecue University? By what mysterious law of thermodynamics can you suspend racks of ribs from the metal rod across the top of the cooker so the rib tips hover 2 inches above the fire (never mind the fat that drips on said fire) but never seem to burn? 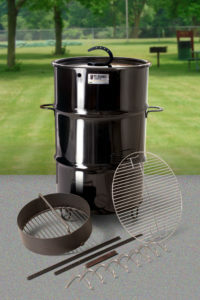 And how can they pack so much cooking performance into a smoker-grill combo that retails for $299 (including shipping)? I called Pit Barrel Cooker inventor and President Noah Glanville at his plant in Strasburg, Colorado, 30 miles east of Denver, to find out. Thus was born the concept for the Pit Barrel Cooker. But it took a year of experimenting and more than two dozen prototypes to find the right size steel barrel (30 gallons—not the traditional 55); the right ventilation system (a 3-inch hole in one side at the bottom, plus four 3/4-inch holes at the top; and the right size wire coal basket at the right height (positioned 1/2 inch above the bottom edge so the air can flow under it) to achieve the set-it-and-forget-it thermodynamics. “The design may seem simple, but it’s completely self-regulating,” Glanville explains. “We don’t have vents or thermostats. Once you light it, it does all the work for you.” This means keeping the oxygen levels low to create an environment where the meat juices and fat drip on the coals without flare-ups. So that’s why the rib ends can hang so close to the fire without burning. The closed environment also seals in moisture. You may be surprised, as I was, to find that the Pit Barrel Cooker has no water pan or drip pan. When the dripping meat juices hit the fire, they become what Glanville calls a “smoke fog” to flavor the meat. This brings us to the question of what exactly the Pit Barrel Cooker is. Smoker? Grill? It defies easy categorization. You can use it for smoking a brisket or ribs or direct grilling a bible-thick rib-eye. “It breaks all the rules,” Glanville says. Like a grill, the food cooks directly over the charcoal (with no water pan acting as a barrier), and one of Glanville’s favorite dishes is a rib-eye steak direct grilled without the lid. Like a smoker, the Pit Barrel Cooker operates as a sealed system, and Glanville sometimes (but not always) mixes unsoaked wood chips with the coals. The upright barrel shape with the fire at the bottom produces convective heat (similar to a convection oven). 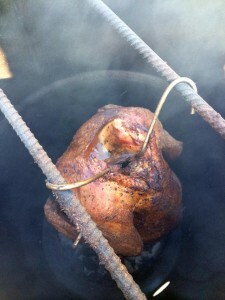 So food smokes faster in the Pit Barrel Cooker than it would on a traditional smoker. The unit performs well at high altitude (as we can attest to at our high altitude BBQ U Colorado Springs campus) and even in frigid Colorado winter conditions. “I can cook at minus 15 degrees,” Glanville claims. Plus, as of January 1 this year, his cookers are not only made out of heavier steel, but are porcelain-coated. One thing is certain: The unit is easy to use. You start with 8 pounds of charcoal. Glanville suggests two ways to light the Pit Barrel Cooker. #2: Fill the coal basket completely and douse the charcoal with lighter fluid. When coals glow orange and the lighter fluid smell has dissipated (12 to 20 minutes), you’re ready to hang the meat. For direct grilling, place the food on the grill grate. Often with a Pit Barrel Cooker, you direct grill with the lid on (which seals in smoke and moisture). To increase the temperature, set the lid ajar by 3/4 inch. (This is also useful for powering through a “stall”—the much-discussed phenomenon wherein the internal temperature of a brisket or other long-cooked meat actually drops a few hours into the cooking process as the moisture on the surface evaporates.) For the high-heat searing of steaks or chops, Glanville recommends cooking with the lid off. 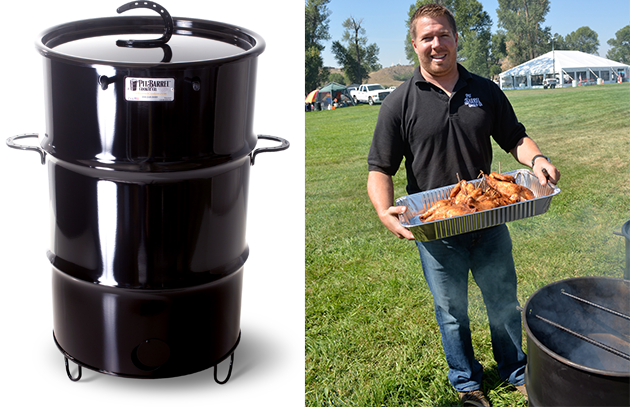 There are two ways to add food to the Pit Barrel Cooker. Hang larger items, like chickens, racks of ribs, or whole beef tenderloins on hooks from the lateral steel bars at the top. Lay chicken pieces, steaks, planked salmon, or vegetables on the removable grill grate. I asked Glanville to name some of his favorite foods cooked in the Pit Barrel Cooker. The short list includes artichokes, corn, sweet potatoes, planked salmon, rack of lamb, baby back ribs and spareribs, prime rib, and rib-eye steaks. Foods that aren’t particularly well-suited to the Pit Cooker? He almost said chicken breasts, but caught himself. Those are pretty good direct grilled, too. Apparently, a growing number of smoking and grilling enthusiasts agree with him. In three years, company revenues have risen from $96,000 to over $3 million. Glanville is currently looking for a larger manufacturing plant. • Brisket (a 14 to 17 pounder): Cook to an internal temperature of 160 degrees (this takes 3-1/2 to 4 hours), then wrap in foil and continue cooking another 2 hours or until the internal temperature reaches 200 degrees. • Prime rib: For a 7-bone roast, let the meat come to room temperature. Hang it on 2 to 3 hooks. It should take 2-1/2 to 3 hours to reach medium-rare. • Whole beef tenderloin: Hang it with the head (big end) up. It should be medium-rare in 1 to 1-1/2 hours. • Rib-eye steak (1-1/2 inches thick): Direct grill 6 to 7 minutes per side with the lid off. • Baby back ribs: Hang and cook 3-1/2 to 4 hours. • Spareribs: Hang and cook 3 to 3-1/2 hours (curiously, Glanville says spareribs cook faster than baby backs). • Rack of lamb: Hang and cook 45 minutes to 1 hour. • Cedar planked salmon: Arrange on the grate and cook 20 to 25 minutes. • Sweet potatoes: Arrange on the grate and cook for 2 hours. • Artichokes: Arrange on the grate and cook for about 1-1/2 hours. • Corn on the cob (husk on): Arrange on the grate and cook for 45 minutes. For more information or to order, go to pitbarrelcooker.com or The Steven Raichlen Store.